I had the pleasure of opening a copy of Black Children’s Literature Got the De Blues on this joyous Multicultural Book Day. While we can not control that the celebrations for under-represented minorities are relegated to literal days, and shortest months of the year, we can rejoice in the written and illustrated works which transcend the invisible barriers of time. I do not believe someone who is not a person of color can know the roads I and my people have traveled, the depths and heights we reach in our trek from children to young adults. This quote is situated within a greater post to advocate for the lyrical, and open authors who have wrote about our experience, to be disseminated to the masses. In today’s celebration we are honoring the importance of having a diversity of writers in the field, telling THEIR stories, and asking readers to humble themselves to engage in the childhood different from their own. With that, I give you my recommendation, within the last hours of the Multicultural Book Day. 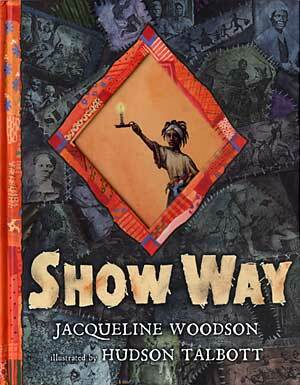 Show Way is based on the Woodson and other’s experiences with Show Ways, or quilts that mapped out the passage to freedom from slavery. The book shows literal growth, as a family reproduces across generations, and symbolic growth as, over time, it represents a quest for freedom that many African-Americans can chart within their own lineage. The story spans geographic space, and travels far in time, to the streets of Brooklyn where Woodson now lives. Join the inter-generational journey through a variety of childhoods which comprised the Black Experience. Join me, and a network of authors and illustrators in this celebration of multicultural voices and drawings that are beginning to decorate bookshelves all over the world. Picture Source: Jacqueline Woodson’s website.